Guests observe more than grooming and appearance. They observe how staff members carry themselves. Therefore the hotel staffs need to know about etiquette and manners and practise them. Courtesy enhances workflow and it is imperative for a good work environment. Etiquette and manners enhance the ability to get along with those around you, making others feel comfortable and important. It enables us to present ourselves to our best advantage but one must remember that the world is changing and the rules must change as a result. While moving through a revolving door, generally whoever comes first lead the way. In case of hotel staff, they should make way for guests, people with physical disabilities, old people, slow travelers and people with bulky packages. Maintain a steady pace and never stop or change speed once inside. The hotel staff should show the way using an open palm gesture whilst holding the door using the elevator door button. One must always hold the door and help people with disabilities or heavy packages. Make room for the guest. Do not crowd or push. If the elevator is too crowded then the hotel staff should volunteer to exit. Never gossip or discuss about other guest or hotel issues whilst in the elevator. Hotel staff should always use the service elevators unless accompanying a guest. The hotel staff should not stare at the guest or themselves through the mirrors while satying inside the guest elevator. The hotel staff should always let the guest pass unless leading the way. Do not rush or push people on a staircase, even if in a hurry. Do not attempt to run on the escalator. Help people with disabilities, children, luggage and people with loose clothing to alight and get off escalators. 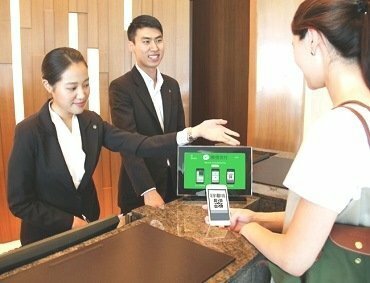 The hotel staff should observe guests approaching the door and open it as the guest walks through. The door is opened in the direction in which the guest is going. Always open the door for the person behind. The hotel staff should greet the guest as he/she passes through the door. The hotel staff must thank anyone who keeps the door open. Guests are more important than staffs or other works. They should always be given first priority. Orders should always be served within standard time. In case an order is expected to take additional time, the service of food and beverages should be planned in such a way that the guest is kept waiting for the least duration. The staff should offer fast beverage replenishment in order to create a positive impression of alertness. The steward should serve and clear at the same time for all guests on a table. The hotel staff should gauge the pace at which the guest would like his/her meal to be served. Service should be provided accordingly. Learn how to use equipment properly. If it is empty and requires refilling, do so to avoid inconvenience to the next user. Since restaurant equipment is shared, take turns at using it and do not quarrel for the same. If the equipment breaks down, fix it or get it fixed immediately. In case you have borrowed equipment, return it to the initial user as soon as possible and in the same condition as received. When you are done, leave the work area and equipment neat and clean and ready for the next user. Do not borrow equipment without prior permission. Use correct posture and technique to carry restaurant equipment in order to avoid injury to self and breakage of equipment. Do not rest foot sole against walls or restaurant furniture. Use the right cleaning agent and fabric to maintain upkeep of the restaurant. Do not bang the doors of the sideboards. Do not carry trays, pepper-mills, dirty linen and other such items under your arms when your hands are full. its a really very good site for all hotelier . if u want to achive your goal this site is very helpful to you. Glad to see such useful and updated information! realy it is good for us, who is working in the hospitality very important these all,,, thanks. Good. Help to all hospitality students and hotelier staffs. These are some top skill points which every hotelier should train in. The best business is word of mouth and repeat business – politeness and a welcoming atmosphere make people want to return time and time again. Very important etiquette that will help develop standards within any resort.